Friends of Rogerson Clematis Collection has received full accreditation and recognition as an official Plant Collection Holder by the American Public Gardens Association. The Friends of the Rogerson Clematis Collection have plenty of which to be proud. The organization has received full accreditation and recognition as an official Plant Collection Holder by the American Public Gardens Association in collaboration with the U.S. Department of Agriculture. The collection, located at the Rogerson Clematis Garden at Luscher Farm, is maintained as North America's most complete collection of clematis in a public garden. The garden is designed and planted by Friends of the Rogerson Clematis Collection. "Your Friends organization stands among a prestigious group of gardens and arboreta that have committed themselves to the conservation and care of specific plant collections curated at the highest professional level," said Pam Allenstein, Plant Collections Manager of the American Public Gardens Association. "Accreditation provides a standard of excellence to maintain a continent wide approach to preserve a germ plasm and plant collection. Criteria for network inclusion includes long term commitment by Friends of the Rogerson Clematis Collection; a curator for the collection and active collection management program including plant records database, mapping of collection, labeling, digital images and a collection policy; and access to the collection for research, evaluation and plant introduction." The collection includes more than 1,800 clematis plants in the garden representing more than 800 varieties. The garden is comprised of seven distinct garden areas including the Beech Tree's Garden that has been designed as a Backyard Bird Habitat by the National Wildlife Federation and certified as a Silver Backyard Habitat by the Audubon Society of Portland and the Columbia Land Trust. 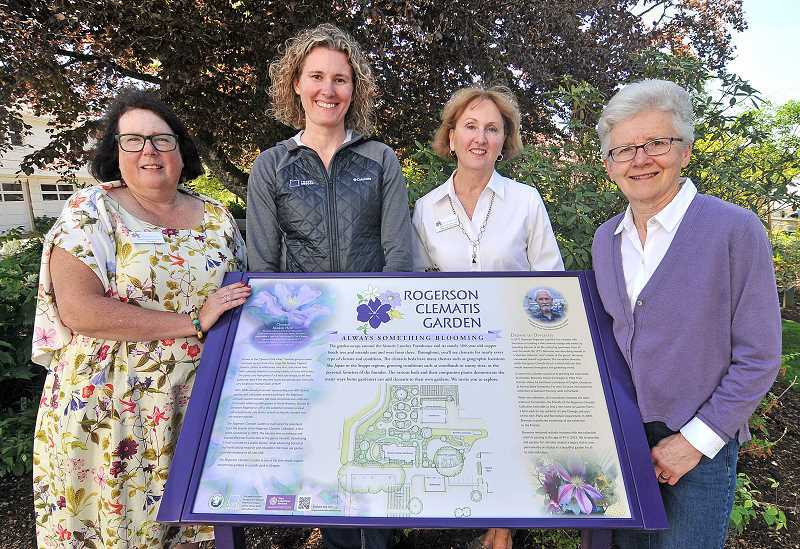 "The Friends of the Rogerson Clematis Collection have worked closely with us for the last 10 years to plant and maintain beautiful botanical gardens at Luscher Farm," said Ivan Anderholm, director of Lake Oswego Parks and Recreation. "The City and appreciative park visitors have benefitted from the dedication shown at the collection from FRCC caretakers." "One request by the City during the development of our partnership was for the Friends group to maintain the orchard with heirloom plants and to surround the farmhouse with heirloom roses, which we did and enhanced clematis also from that time," said Phyllis McCanna, president of FRCC. As a result of its diligent work, FRCC was honored last fall by Travel Oregon. "We received a grant from Travel Oregon and the Stanley Smith Family Horticultural Trust for interpretational or way-finding signage and an accompanying brochure," McCanna said. A special event for the unveiling of the signs and the announcement of the accreditation took place May 2. The FRCC will host its annual "Inviting Vines" clematis garden tour May 26. The event includes tours of four private gardens in Lake Oswego's First Addition and West Linn. "In addition, this year's event includes both breakfast and tea as well as private docent-led tours of the Rogerson garden," McCanna said. "Our speakers at both the breakfast and tea will start where our special host last year, Mike Darcy, left off on the history of the garden at Luscher Farm. Lucy Hardiman, respected garden designer and fifth generation Oregonian, and Linda Beutler, collection curator, will share stories about the garden design, plant selection and history of the plants arriving with the early settlers in the 1800s. Guests will receive handwritten notes from the garden design in 2004-05." Learn more about Inviting Vines online at rogersonclematiscollection.org.